Real-time temperature, humidity, location, light and shock GSM tracking for smart logistics worldwide, anywhere and anytime. tempmate.®-GS offers real-time monitoring which is up-to-date with latest developments. The cutting-edge technology combined and approved quality of German engineering form the basis of this innovative and reliable device. We call it “Cold Chain Monitoring 4.0”. With tempmate.®-GS you are able to take actions in time and save your goods before it is too late! If necessary, a replacement of goods can be organized in a short time so that a delivery deadline will be met despite of a loss of goods. Lost or damaged shipment can be located and culprits can be clearly defined. Therefore, warranty claims will be fulfilled. All relevant measurement data can be continuously recorded by using our tempmate.®- Cloud. We’ve also made tracking data more efficient for multiple team members by allowing it to be checked, managed, and analyzed online. This global connectivity lets your online team monitor information continuously, allowing them to then react to a problem before it occurs, while it’s in transit, or after it’s been delivered. Recorded data can be easily shared with others via a link or an email. No additional software is required, just a web browser with Internet access. Your data is securely protected against access from third parties. Our databases are stored in multiply secured server centres in the EU. Data protection and data integrity regulations are obeyed offering maximum security. Last but not least you remain in complete control of costs as there are no additional “hidden” charges. Can tempmate.®-GS be applied for pharmacy? tempmate.®-GS perfectly suites to any field of application, including product piracy. For transportation of pharmaceutical products it will do a great job, as in this case tempmate.®-GS will help to save you a lot of time and money. The research showed that there is a big percentage of losses in the field pharmacy due to pharmaceutical theft and, additionally, the losses of the products due to incorrect temperature during transportation – all that can be solved thanks to tempmate.®-GS. Can the tempmate.®-GS work more than 90 days? We give guarantee that the logger will work 90 days with constant temperature -30 °C. With mild temperatures, the logger will work even logger, but we do not give guaranty for more than 90 days, therefore the customer can use it more than 90 days but under his own risk. Is there any application for smartphone for tempmate.®-GS and tempmate.®-Cloud? Right now the application is not available, but tempmate.®-Cloud can be started in any smartphone browser and can be used there without any problems. We are very flexible and can implement any feature which is required, therefore, we are interested in feedback of our customers in order to make our devices and solutions even better. Is it possible to check in the cloud if and when the tempmate.®-GS has uploaded data? In the Device Overview you can see the last upload under “Last Activity” and in the “Device Evaluation” you can display the individual transmission intervals for the count (as time of saving in the database). What SIM card do I need for the tempmate.®-GS? The SIM card is already integrated in the device, in the form of a SIM chip. The data volume is already paid for you. Is there a possibility to try out tempmate.®-Cloud for free? If you would to try out our tempmate.®-Cloud, please click here “Demo Account“. Can I use the tempmate.®-GS more than once? No, it is a single use product. With frequent shipments and no (or only very expensive) recycling possibilities the costs are recouped via the number of items. Can I stop the tempmate.®-GS? Yes. Press the button on the tempmate.®-GS and hold it down for more than 5 seconds, and the stoppage will be confirmed when the LED flashes very quickly. Can I start the tempmate.®-GS from a distance? The logger can be manually started with a delayed or planned start time, and it will then start working only when the defined amount of time has passed. It is not possible to start the logger from a distance for reasons to do with energy management, because this would massively reduce the runtime. Can I download a report for evaluation purposes? If so, how? Yes, you can find all reports for evaluation in the Cloud, which is where these are permanently stored. You can also download these reports for evaluation offline, for example as a PDF, via the tempmate.®-Cloud. Can the tempmate.®-GS be programmed? All tempmate.®-GS devices are delivered in a standard, “ready to use” configuration. Alternative settings can be made via the tempmate.cloud. Register your tempmate.®-GS and adjust the settings there and then, before the device is started by clicking on “edit” in the Device Overview. I have started my tempmate.®-GS with the wrong settings. How can I change them? In order to achieve high data security, and prevent any manipulation of data, the settings on the logger can only be changed before it is started. Can single and cumulative alarms be programmed? Yes, both are possible, and they also use a delayed alarm setting. Up to 6 alarms can be set up, depending on the size. Are the tempmate.®-GS devices calibrated? With each tempmate.®-GS you will receive a “Certificate of Validation” as proof of its accuracy. This is available for you in digital form in the Cloud. Furthermore, the temperature and air humidity sensor is self-calibrating and can compensate independently for any fluctuations. Although the tempmate.®-GS is a single use logger, ALL devices are individually tested! There are no batch calibrations. Can I also order the tempmate.®-GS one at a time? 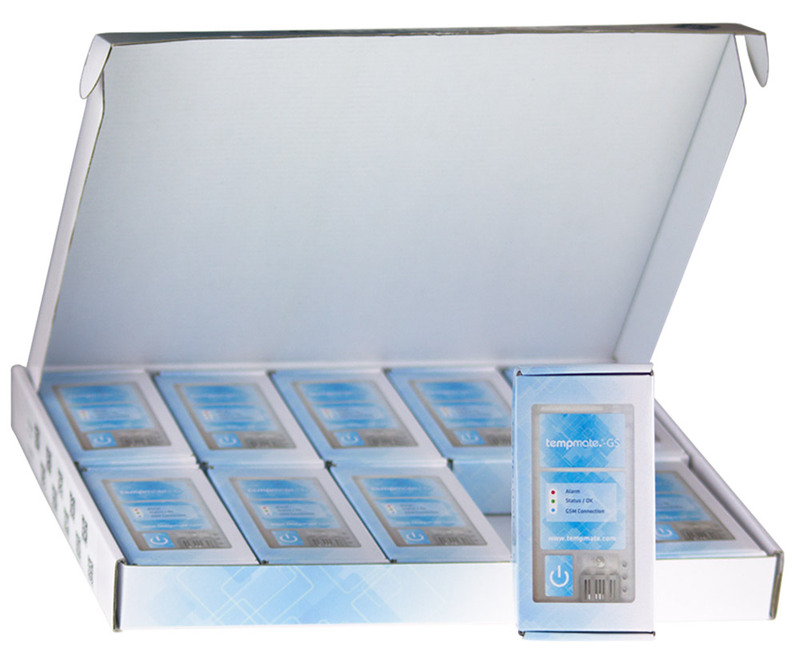 The tempmate.®-GS is only sold in multipacks, and one multipack contains 10 tempmate.®-GS devices. If you would like to try out the tempmate.®-GS without obligation, then please send a request to us on the contact form that we provide. Our sales team will then be in touch with you as quickly as they can. Is there anything I need to be aware of when I am shipping the loggers, as far as the current IATA regulations are concerned? Are there any other restrictions on the shipping of these data loggers? A maximum of 100 tempmate.®-GS devices can be included in each shipment (Lithium <5kg). If the logger has been activated, it must be manually set for shipping by air for the duration of the flight. An automatic flight mode is currently at the certification stage and will be available very soon. Can I use the tempmate.®-GS to ship frozen food? Yes, the tempmate.®-GS meets the standards according to EN12830, and this means that it is permitted for use when sending frozen food. Can I dispose of a used logger by throwing it into my domestic waste bin? No. Please dispose of a used logger by taking it to the proper place for electronic waste disposal. If you do not have access to an appropriate electronic waste disposal centre, please enquire with your local waste disposal agency to find out where there is a suitable facility for disposing of electronic waste. How much does a tempmate.®-GS cost? If you send us an enquiry using our contact form, we will send you a complete price list, or alternatively, write to us by email at sales@imec-group.com. Can the tempmate.®-GS be recalibrated? It is a single use product, and that is why recalibration is not possible. If your quality management system requires a recalibration to be carried out after a certain period, please use the data logger within this period. 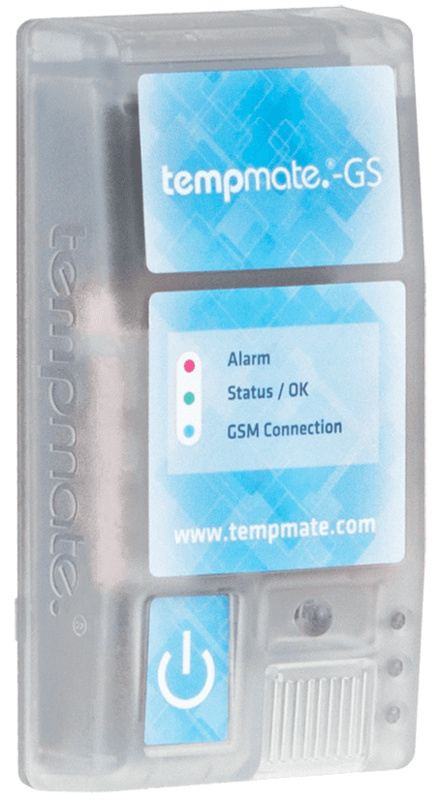 Moreover, the tempmate.®-GS has its own self-calibrating temperature and air humidity sensor, which makes recalibration unnecessary. Can the tempmate.®-GS still be used after its use-by date? The loggers can still function after the use-by date has passed. If you use it after the use-by date, then you do so at your own risk. It is not guaranteed that the logger will meet its expected accuracy and runtime requirements. It is therefore recommended that you should only use the tempmate.®-GS when it is within its use-by period. How can I order the tempmate.®-GS ? Send your us order requirement using the contact form on our website with your selected configuration. Our sales team will contact you as quickly as they can. Is it possible to have a test sample? Yes, of course you can have a test sample, if you want to try it out. Just send us a request for this using our contact form. How big is the tempmate.®-GS measurement range? You will find all the technical details relating to this product in summary form on the data sheet. Link to the data sheet. 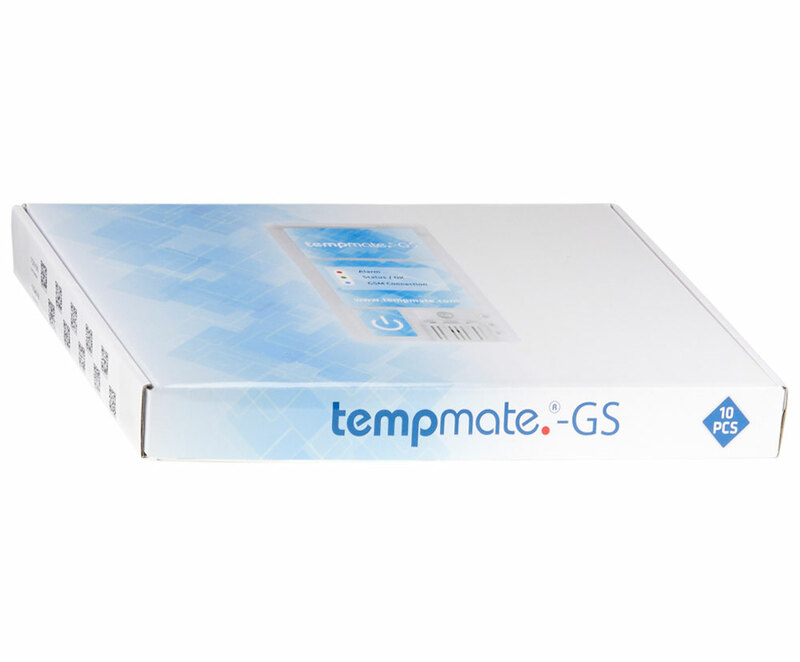 What is the delivery time for the tempmate.®-GS? The tempmate.®-GS devices are delivered from our warehouse. Your order will normally be processed within 24 hours. If you have any questions about availability, please use the contact form. What additional costs arise if a special configuration is requested? You can change the configuration of the tempmate.®-GS free of charge in the Cloud. If you need to program a large number of them quickly, you can do this by saving the most commonly used settings as Presets. It should, in future, be possible for us to do a factory-based configuration, and we can give you more information about this in a separate message. My location is not showing accurately. Is the device faulty? No, the location notification is done through the GSM module, and this means that there can sometimes be discrepancies of several kilometres, because the logger always communicates with the nearest available transmitter when it is notifying locations. I have a delivery going to “…”, can I use the tempmate.®-GS for this one? You can find a list of the complete network coverage at: https://www.tempmate.com/product/tempmate-gs/ In principle, the system can be used in practically every country in the world. If your destination country is not included in the coverage list, please send us a message about this using our contact form. Does the tempmate.®-GS have GPS? How does it send the data without GPS? No, it does not have GPS. It is widely, but incorrectly, believed that the data are transmitted via GPS. GPS is only the “Global Positioning Service”, which the system uses to calculate its own position. This system is not set up to transmit data in both directions. We use something else to transmit data, namely similar-sounding GSM technology (Global System for Mobile communication), in short, the cell phone network. Can the data logger be used for a stationary monitoring situation? Of course, and it will not need to have any impact on the existing network system. I have started the data logger, but I do not see any data. The status in the Device Overview in the Cloud should be set as “active” within half an hour. Please ensure that the data logger has reception, whenever it is started. Display of the measurement data can be delayed by up to 24 hours, depending on the transmission interval that has been stipulated in the settings. My data logger is not reacting anymore! What happens when the data logger has no reception? The data are stored in the logger. They will be automatically transmitted as soon as the tempmate.®-GS has reception again. Please make sure, when you are starting the data logger, that it has good enough reception to log itself into the Cloud. What kind of SIM-card do I need for the tempmate.®-GS? There is already an integrated SIM-card inside the device, in the form of a SIM chip. The data volume charge has already been paid on your behalf. Can you check in the Cloud, whether and when the tempmate.®-GS has uploaded data? In the Device Overview you can see the last upload under “Last Activity” and in the “Device View” you can display a graph of the individual transmission intervals (as times when data was stored in the database). The LEDs on my tempmate.®-GS are flashing constantly, what does this mean? blue: indicates that the device is carrying out a transmission (fast flashing), or that the last data have been successfully transmitted (slow flashing). green: indicates that the device has been started, and there is no alarm. A correct start is confirmed with a series of 10 flashes. Status OK, no alarm, is indicated by slow, green flashing. If the LED stays green for 3 seconds, after the device has been started, this means that it has successfully connected to the Cloud (initial data set) and if it stays green for 3 seconds after it has been stopped, this means that the last set of remaining data has been successfully transmitted. red: indicates that the device has registered an alarm (slow flashing, green is not flashing any more). Successful stopping of the device is indicated by 10 fast flashes. Finally, the device delivers its last set of data, and then carries on logging in the background until the battery runs out.